Big Browns, Musky, GT's!!! When, Where, & How! Steve Maeder: 12:45 pm Steve is an Ellensburg local who has truly fished every river, lake, creek, ditch, and mud puddle that exists in Ea WA. He has found some gems in that mix, and he is always willing to share ideas with fellow anglers. His presentation will focus specifically on Bass, however his presentations always evolve into areas of interest based on the audience's question. Steve works with Northwest Fly Fishing magazine, so he truly appreciates the value in sharing information with fellow anglers. 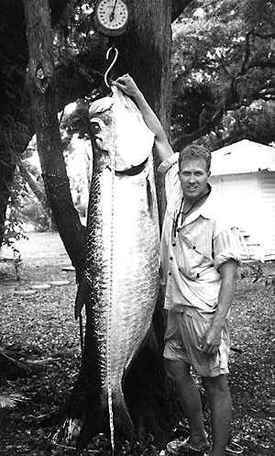 Jim Holland Jr: 11:15 am Jim Holland landed the world record tarpon on the fly. Among all of the elite anglers, professional guides, elite businessman, and celebrities who have ever pursued tarpon on the fly (and many have become rabid in their pursuit! 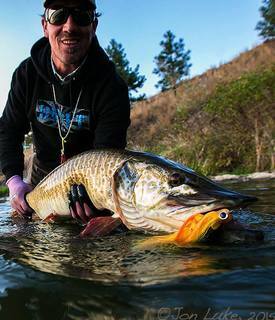 ), Jim managed to land the largest of all time. He is here to share that amazing story with you, as well as give you some tips for fighting big fish. 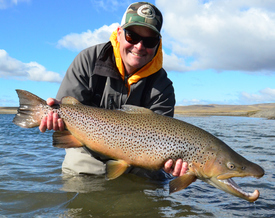 Steve Joyce: 12:00 pm I've intentionally not posted the slide show from my recent trip to Tierra Del Fuego for sea run brown trout so we can unveil it first at this Rendezvous. Rio Grande in TDF is a "Klickitat sized" river that hosts a prolific run of brown trout that do exactly what steelhead do - being born in the river and migrating to the ocean where they grow large before returning to their native watershed to spawn. We landed several BROWN TROUT over 20 pounds using 2 handed rods and versions of traditional swung fly presentations. Joe Rotter: 1:30 pm There are lots of flats around the globe, and fishing is similar on all of them - unfortunately, so are some of the challenges we encounter including wind, clouds, and spooky fish! Joe is going to give you some advice and pointers on how to make your flats fishing experience more productive! 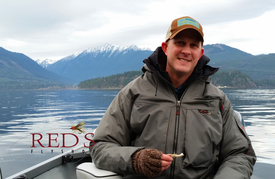 Chad Gillespie: 2:15 pm We are lucky to live in the Pacific NW where we have so many diverse fisheries surrounding us. Captain Chad is going to focus on the Western one - highlighting the Sea Run Cutts of Puget Sound and Hood Canal. We hope to see you here Saturday!